CANDIDATES WHO HAVE POSSESSED ABOVE REQUIRED QUALIFICATION MAY SEND THEIR LATEST/ UPDATED RESUME ALONG WITH SCANNED COPIES OF PASSPORT, ADHAAR, PHOTO (WITH WHITE BACKGROUND), DEGREE CERTIFICATE, EXPERIENCE CERTIFICATE AND PROMETRIC CERTIFICATE (IF AVAILABLE) TO saudimoh.norka@gmail.com . PLEASE MENTION THE SUBJECT AS “CV TO SAUDI MOH”. Medway NHS Foundation Trust Hospital UK, are seeking experienced staff nurses across all specialities. We do not charge any fee or service charge from our candidates. 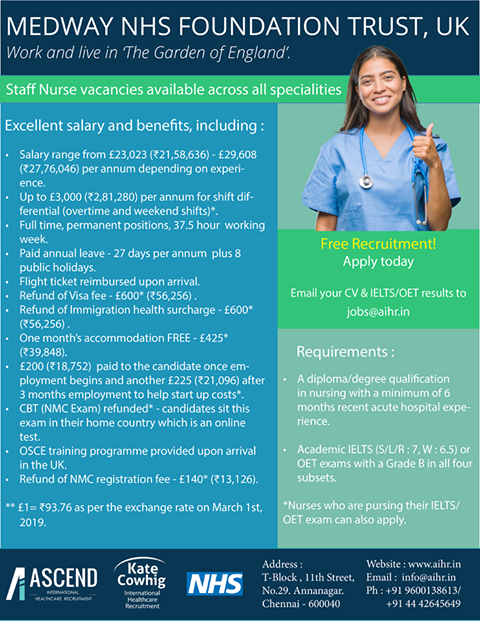 Urgently Required Staff Nurses for MALDIVES MOH Hospitals. Interested and eligible candidates can apply. More details given below. 10.EXPERIENCE CERTIFICATE WITH SUPERINTENDENT SIGN. 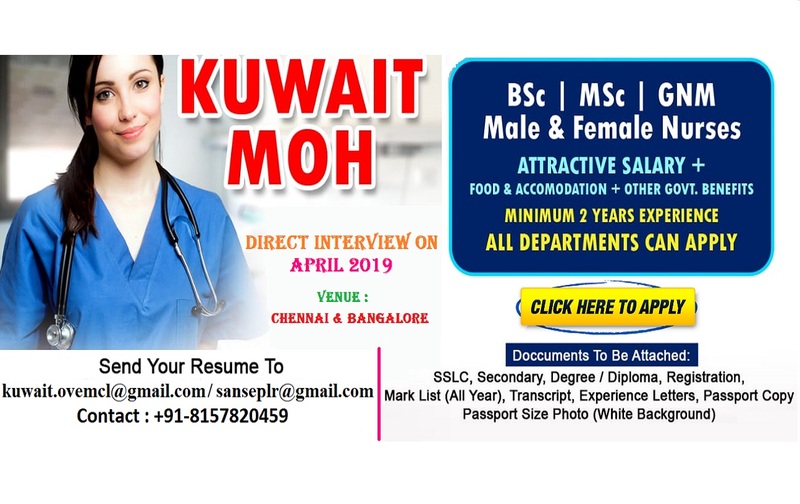 KUWAIT MOH - DIRECT INTERVIEW ON APRIL 2019. 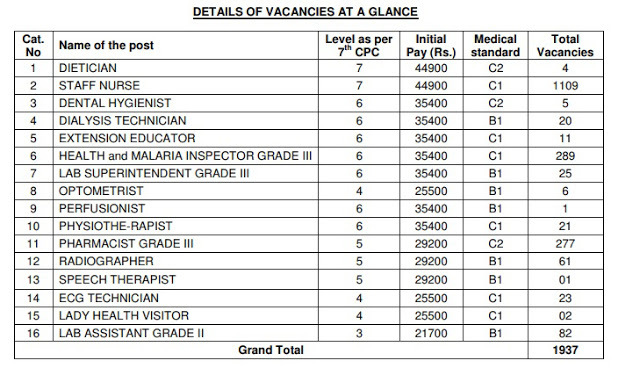 INTERESTED AND ELIGIBLE CANDIDATES. MORE DETAILS GIVEN BELOW. INTERVIEW FOR STAFF NURSES (Females) FOR PRINCE MOHAMMED BIN ABDUL AZIZ HOSPITAL , RIYAD , MINISTRY OF HEALTH , Kingdom of Saudi Arabia. INTERESTED AND ELIGIBLE CANDIDATES CAN APPLY. MORE DETAILS GIVEN BELOW. 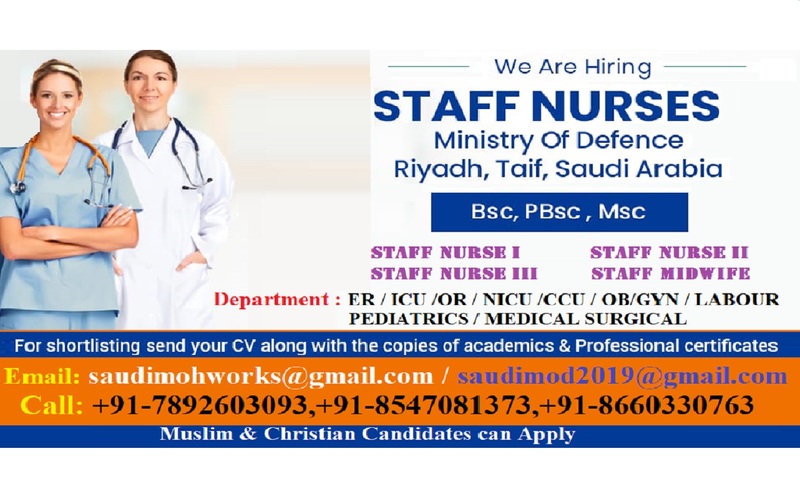 AL MAGRABI HOSPITAL STAFF NURSE RECRUITMENT 2019, SAUDI ARABIA. INTERESTED AND ELIGIBLE CANDIDATES CAN APPLY. MORE DETAILS GIVEN BELOW. Candidates should have requisite minimum Educational/Technical/Professional qualifications indicated for the posts in Annexure-A of this CEN, from a recognized Board/University/institute as on the closing date for ONLINE Registration (02.04.2019). Those awaiting results of the final examination of the prescribed Educational/Technical/Professional qualification SHOULD NOT apply. For all candidates except the fee Concession categories mentioned below. Out of this fee of `500/- an amount of Rs 400/- shall be refunded to their bank account duly deducting bank charges, on appearing in CBT. Staff Nurse Recruitment for Al Qassim National Hospital, Saudi Arabia. Interested and eligible candidates can apply. more details given below. 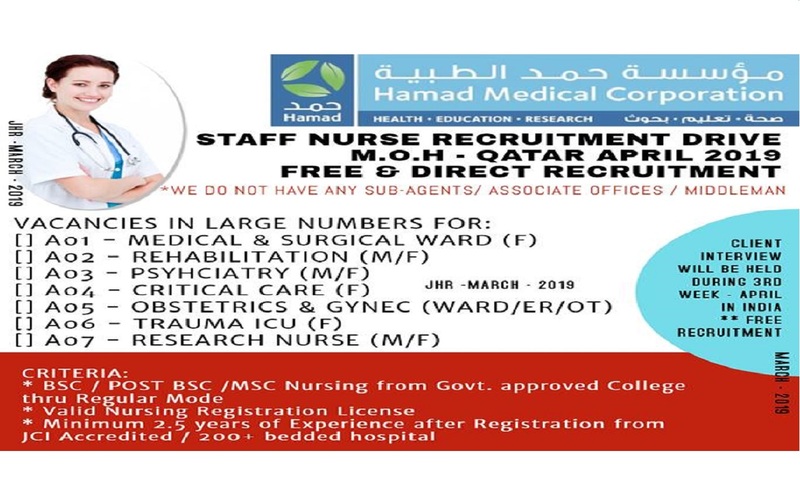 FEMALE STAFF NURSES FOR KING KHALID UNIVERSITY HOSPITAL, RIYADH, SAUDI ARABIA. INTERESTED AND ELIGIBLE CANDIDATES CAN APPLY. MORE DETAILS GIVEN BELOW. INTERESTED AND ELIGIBLE CANDIDATE CAN SEND YOUR UPDATED CV AND ABOVE MENTIONED DOCUMENTS TO BELOW E MAIL . AND FOR MORE HELP CONTACT ON BELOW GIVEN NUMBERS .